You stub your toe, bang your elbow, or lift a heavy box the wrong way. You know you’re hurt – and others do too as you cry out in pain! But what about your furry friends? With sudden or acute pain, your pet may cry out, but what if he doesn’t, or what if he’s suffering from chronic pain, as is common with arthritis and dental disease? How do you know he’s in pain? Pets feel pain the same way we do, but they can’t tell us about it in the same way. If they can’t tell us with words, is there any way to know if Fido or Kitty is in pain? The short answer is yes! The long answer is that there are many signs that may indicate that your pet is uncomfortable. Signs of acute pain may be more obvious – pets may try to bite you or scratch you if you go near or touch the area that’s painful. Signs of chronic pain may be less obvious. 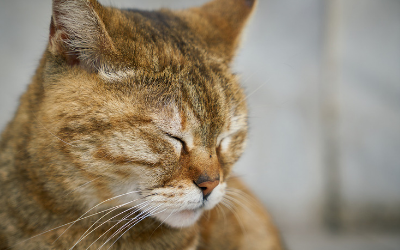 Purring – purring can be related to pain! Don’t try to treat your pet’s pain on your own. Your pet may be experiencing what is called “referred pain” (pain felt in a part of the body other than its actual source). Your veterinarian will need to determine where the pain is originating from and treat it accordingly. Treatment may need to address more than just pain relief. For example, if your pet has a scratch on his cornea, this is what needs to be treated – pain medication will not correct the problem! Lastly, many pain relievers that are safe for us to use are toxic and even fatal to dogs and cats. Untreated pain is not something that any pet should experience. By paying attention to your pet’s behavior, you will be the first to notice the changes that may indicate that your pet is in pain. Know the signs, pay attention, and call your vet if you notice any changes. Your pet will thank you for it.